The 2012 United States presidential election in Oklahoma took place on November 6, 2012, as part of the 2012 General Election in which all 50 states plus The District of Columbia participated. 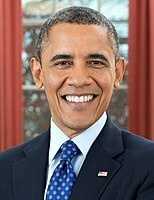 Oklahoma voters chose seven electors to represent them in the Electoral College via a popular vote pitting incumbent Democratic President Barack Obama and his running mate, Vice President Joe Biden, against Republican challenger and former Massachusetts Governor Mitt Romney and his running mate, Congressman Paul Ryan. Oklahoma in recent years has become one of the most conservative states in the nation; in both 2008 and 2004, Republicans took over 65% of the vote in Oklahoma and won every county in the state. In 2012, this Republican trend continued as Mitt Romney swept the state of Oklahoma with 66.77% of the vote, while Barack Obama took only 33.23%. With 66.77% of the popular vote, Oklahoma would prove to be Romney's third strongest state in the 2012 election after Utah and Wyoming. Note: The Oklahoma SoS website only lists the Democrat and Republican results. No third-party results are available. President Obama faced four challengers in Oklahoma's Democratic Primary. Challenger Randall Terry took 12 counties with candidate Jim Rogers winning in three counties. Candidates Bob Ely and Darcy Richardson also appeared on Oklahoma's ballot but failed to obtain a majority of votes in any county. The Republican primary took place on Super Tuesday, March 6, 2012. Oklahoma has 43 delegates to the 2012 Republican National Convention. Three super delegates are unbound by the primary results. 15 delegates are allocated by congressional districts, 3 delegates for each district. If a candidate gets a majority in the district, he takes all 3 delegates; if no one gets a majority, the delegates are split either 2-to-1 or 1-1-1 depending on how many candidates get at least 15% of the vote. Another 25 delegates are awarded to the candidate who wins a majority in the state, or allocated proportionately among candidates winning at least 15% of the vote statewide if no one gets majority. Fifteen delegates to the 2012 Republican national convention were elected at congressional-district conventions March 31 to April 14, 2012 — three from each of Oklahoma's five congressional districts. The Oklahoma Republican State Convention was held May 11–12, 2012 in Norman. Irregularities were reported. At least two Ron Paul supporters said they were physically attacked by Romney supporters. Oklahoma's (Republican) Governor Mary Fallin tried to speak at the convention. After loud chants of "Ron Paul" from the floor, she stated (referring to Romney) "We have a presidential nominee", resulting in loud booing. Paul supporters said that the convention was stopped with unfinished business, without a two-thirds vote, and therefore against parliamentary procedure. It was reported that, after the convention was said to be adjourned, a partition in the room was moved, isolating many attendees from the rest of the body. The lights were turned out momentarily. After the convention was stopped and the chairman left, many Paul supporters assembled outside and held a rump convention, chaired by Jake Peters, at which they elected a slate of Paul supporters as delegates to the national convention. Four Paul supporters, including Jake Peters, made a formal complaint to the Oklahoma Republican Party, saying that Party rules were broken by failing to take a roll-call vote on the delegate slate and that the convention was adjourned without the required vote. The complaint asserted that state law is involved in the Republican Party's nominating process and cited case law to the effect that party process should be considered "an integral part of the State's election system". ^ "Oklahoma State Election Board". Retrieved 2012-11-24. ^ a b "Oklahoma Republican Presidential Nominating Process". Retrieved May 16, 2012. ^ McNutt, Michael (May 13, 2012). "Oklahoma Republicans elect delegates to national convention". newsok.com. Retrieved May 16, 2012. ^ a b "Rachel Maddow Discusses Ron Paul & GOP Conventions Chaos". May 14, 2012. Retrieved May 15, 2012. ^ "2 Romney Supporters ASSAULT 2 Ron Paul Supporters in OK". www.youtube.com R11110000. May 13, 2012. Retrieved May 25, 2012. ^ a b c "Violent OK GOP State Convention". newsODP/www.youtube.com. Retrieved May 15, 2012. ^ a b "Ron Paul Supporters Submit Challenge to Oklahoma GOP State Convention". Retrieved May 25, 2012. ^ "Ron Paul Supporters Stage Rump Convention in OK – May 12, 2012". Retrieved May 15, 2012. ^ "Rules of the Oklahoma Republican Party, Amended August 27, 2011" (PDF). Retrieved May 25, 2012. ^ "Report of the Committee on Rules and Order of Business". Oklahoma Republican State Convention. May 12, 2012. Retrieved May 25, 2012. This page was last edited on 22 April 2019, at 05:34 (UTC).